The University of Utah on Aug. 31 will mark the one-year anniversary of the opening of its state-of-the art law school by announcing the facility has been awarded a prestigious LEED platinum designation by the by the U.S. Green Building Council (USGBC). LEED is an acronym that stands for Leadership in Energy and Environmental Design. The designation is awarded to buildings that meet standards of being green and efficient in their design. LEED-certified spaces use fewer energy and water resources; save money for taxpayers, businesses and other building owners; reduce carbon emissions; create jobs; and establish a healthier environment for residents, workers and the larger community. The U’s law school is the first in the western United States designed to earn such a designation and is believed to be only the second law school in the country to achieve the status. A celebration is planned at the law school on Aug.31 from 5:30 to 7:30 p.m., where speakers will discuss how the LEED platinum facility has benefited the university community. Building tours will follow brief remarks from university leaders. The law school’s LEED designation adds to an already impressive list of LEED facilities in Utah, a state that earlier this year ranked among the top 10 U.S. states for LEED-building per capita. 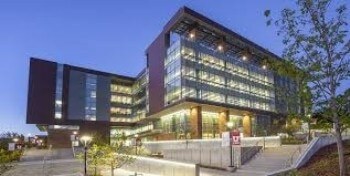 The law school joins 40 other LEED facilities in Utah certified to LEED platinum status. The law school, however, is the highest achieving LEED platinum higher education project in the state based on the number of points award. The law school built its LEED platinum building with assistance from the Alternative Visions Fund of the Chicago Community Trust, which provided $4.5 million towards the purchase of sustainable building infrastructure. Many of the law school’s sustainability features serve as examples to other building projects on the campus of the University of Utah, the Salt Lake community, and the nation, and some are models of innovation For example, building windows employ biomimickry to prevent bird collisions. Biomimickry creates ultraviolet spider web designs that are visible to birds but not humans. A building designed with the goal of achieving 65 percent reduction in energy costs beyond code requirements through smart structural design and passive solar orientation. Investments in onsite solar power generation and maximum use of natural light. Chilled beam cooling and heating systems and highly efficient fixtures. Recycling and re-using grey water to flush toilets. Enhanced exterior insulation to reduce thermal conductivity. Fixed exterior sunshades to minimize solar heat gain during the summer. Exterior overhangs that also act as sunshades to reduce the building heat gain in the summer. Low emissivity, insulating glass to reduce thermal transmittance and glare while improving visible light transmittance. The chilled beam HVAC system to heat and cool the building, radiant floor heating and cooling to supplement the chilled beam system. A heat recovery system to transfer the heat from the exhausted conditioned air into the fresh ventilation air. Regenerative elevators to convert the excess energy generated by an elevator into electricity that can be used elsewhere in the building. Enhanced lighting system control that include occupancy sensors and daylight sensors. A complete list of the building features used to evaluate its LEED platinum status is available by clicking here. Evaluators examine a checklist of items and award points to a building for its various sustainable features. The law school received a score of 87 points by LEED evaluators. At least 80 points are necessary for LEED Platinum certification. Prior to the LEED platinum designation, the building garnered other awards for its innovative features. Lead architect Sean Thompson of the VCBO/Smith Group architecture received a “community justice award” from the Disability Law Center for the building’s universal accessibility design. Energy engineer Steve Connor of Coleman Engineering was also a finalist for the governor’s energy innovation award for designing the building’s unique use of groundwater to help air condition the facility by using groundwater from a campus well. The building itself received the Most Outstanding Green/Sustainable Building Award for 2015 from Utah Construction and Design, and the 2016 Alta Sustainability Leadership Award for Sustainable Campus Transformation, as well as recognitions from the Virginia and Maryland chapters of the American Institute of Architects (AIA). And Big-D Construction Corporation earned the 2015 Green Building Champion of the Year Award from the Associated Builders and Contractors, Inc.
“This is truly an impressive accomplishment. We expect LEED silver certification for all new buildings on campus given the University requirements for energy efficiency, water conservation, occupant health and safety, and sustainable materials. Fewer than 5 percent of LEED projects undertaken anywhere, however, achieve Platinum status. Why? Because it is not enough to have a great architect, which we were also fortunate to have in VCBO/Smith Group,” said Amy Wildermuth, the U’s chief sustainability officer. “In order to attain this level of success, the S.J. Quinney College of Law had to be fully engaged in the building process from pre-planning to completion. We are very grateful to the faculty, staff, students, administration—and particularly Dean Bob Adler—for their efforts to accomplish this amazing level of performance and for serving as a model,” Wildermuth said. Besides its environmental merits, the new building has aided the college’s already substantial commitment to community service and community-engaged learning. University of Utah law students provided more than 40,000 hours of pro bono and clinical service to underserved clients last year. The $62.5 million building provides accessibility for people with a full range of disabilities. Located at the southwest corner of campus across from the Stadium TRAX station, the building established a welcoming gateway for visitors to campus when it opened last year. The building has received ongoing generous support from the S.J. and Jessie E. Quinney Foundation, the University of Utah, the Church of Jesus Christ of Latter-day Saints, the Alternative Visions Fund of the Chicago Community Trust as well as a number of law firms and individual donors. Big-D Construction completed work on the 155,000-square-foot building.